Lineage: Constituted 384th Bombardment Squadron (Light) on 28 Jan 1942. Activated on 2 Mar 1942. Redesignated: 384th Bombardment Squadron (Dive) on 27 Jul 1942; 530th Fighter-Bomber Squadron on 30 Sep 1943; 530th Fighter Squadron on 30 May 1944. Inactivated on 16 Feb 1946. 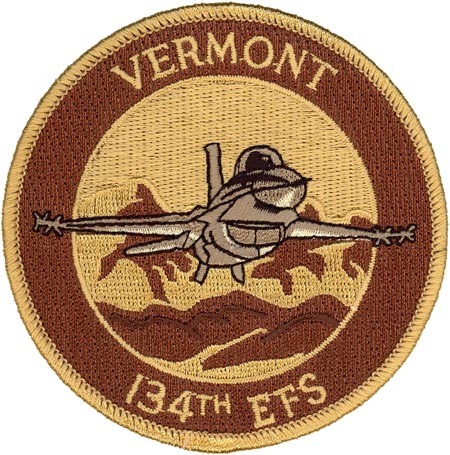 Redesignated 134th Fighter Squadron, Single Engine and allotted to the Air National Guard 24 May 1946. Extended federal recognition 14 Aug 1946. Redesignated: 134th Fighter-Interceptor Squadron on 1 Nov 1952; 134th Defense Systems Evaluation Squadron on 9 Jun 1974; 134th Tactical Fighter Squadron on 1 Jan 1982; 134th Fighter-Interceptor Squadron on 1 Jul 1987; 134th Fighter Squadron on 15 Mar 1992-. Stations: Will Roger Field, Okla, 2 Mar 1942; Hunter Field, Ga, 4 Jul 1942; Waycross, Ga, 22 Oct 1942 – 18 Jul 1943; Nawadih, India, 20 Sep 1943; Dinjan, India, 18 Oct 1943 (detachment operated from Kurmitola, India, 21 Oct-Nov 1943, 28 May- 11 Jun 1944; Warazup, Burma-June 1944); Kwanghan, China, 21 Oct 1944 (detachment operated from Hsian, China, 30 Oct 1944-21 Feb 1945); Pungchacheng, China, 5 May 1945; Hsian, China, Aug 1945; Shanghai, China, 17 Oct 1945-16 Feb 1946. Burlington IAP (later: Ethan Allen AFB; Burlington ANGB), 24 May 1946-. Aircraft: V-72, 1942; A-36, 1942-1944; P-51, 1944-1945. F-47, 1947-1950; F-51, 1950-1952; F-94, 1953-1958; F-89, 1958-1965; F/TF-102, 1965-1974; EB-57, 1974-1982; F-4, 1982-1986; F-16, 1986-. Operations: Combat in CBI, 17 Oct 1943-21 Jul 1945. Fifth Air National Guard unit to be formed and federally recognized. Called to active duty as part of the Korean War call-up, 10 Feb 1951-31 Oct 1952. Air defense of Vermont and New England. Evaluate both air and ground radar systems, 1974-1982. Ground attack and close air support, 1982-1989. Air defense, on 5-minute alert, seven days a week, 24 hours a day, 1989-1997. In 1998, equipped with the Theater Airborne Reconnaissance System (TARS) with an added mission of tactical reconnaissance. Participated in: Operation Southern Watch, 2000; Operation Noble Eagle, 2001-; Operation Iraqi Freedom, 2004, 2005, 2006 & 2007.